Step 1 Bring a large pot of salted water to boil. Meanwhile, heat the olive oil and garlic in a large skillet over medium heat. Taste a bit of sea urchin. If it seems bitter, add a pinch of red pepper flakes to the skillet. Cook until the garlic is soft but not yet golden, 2 to 3 minutes. When the garlic has softened, add the white wine to the skillet and raise the heat to high. Cook until the wine has reduced by about half, 4 to 5 minutes. Step 2 Add the clams and 1 1/2 trays of sea urchins, reserving the best for garnish. Cover and cook, stirring frequently, until the clams are all open, about 5 minutes. Step 3While the sauce is cooking, add the spaghetti to the boiling water. Cook until it is just short of al dente, soft but with a thin thread of crunch in the center, about 7 minutes. Step 4When the clams have opened, remove the skillet from the heat and stir to break up as much of the sea urchins as possible. They should blend into the sauce. Step 5When the spaghetti is done, drain it, reserving one-half cup of the cooking water. Add the spaghetti and the reserved cooking water to the sauce and place it over high heat. Cook, stirring constantly, until the sauce has slightly reduced, about 2 minutes. Taste and add salt if necessary. Step 6Divide among 6 heated pasta bowls and garnish with the reserved sea urchin and several leaves of parsley. Serve immediately. In Recipes-list.com we have selected the most viewed recipes from category - Fish and shellfish Main courses Quick and easy . Enjoy the best recipes specially selected for you! 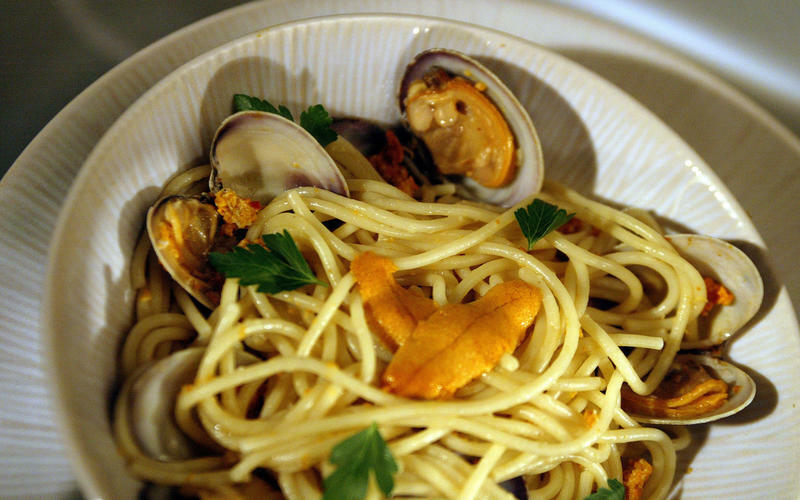 Spaghetti with sea urchins and clams is the right choice that will satisfy all your claims.